Google is positioning itself for the future. It’s conquered search on the Internet, revolutionized advertising with AdSense, and opened the door for the development and acceptance of Web applications like Gmail and Gcal. At the same time Google is leading a media renaissance with the acquisitions of YouTube, Blogger, Picasa. It’s a natural fit. Google takes what it has pioneered on the desktop and through the browser and applies it to mobile lifestyles, providing a seamless transition for people on the go. At the same time it opens up new opportunities for search and advertising, expanding the “Googleverse”. Google has acknowledged a strong interest in moving its search applications and other content onto mobile phones, where it hopes to command premium prices for super-targeted advertising. (If you're searching for pizza places on your mobile phone, you're probably hungry right this minute, making you an ideal marketing target for a local restaurateur.) And Google has been working with carriers and handset makers to get Google's maps, mail and other applications on mobile phones. ..."All these things - Net neutrality, Google's interest in the 700 Megahertz auctions - these are all examples of the collision of technology and the communications sector," says Scott Cleland, a self-described "tech-com" analyst who clearly is aligned with the communications camp. "If you think of two cars colliding, one car can take the other in a different direction, but sometimes, they both take each other in an entirely new direction." With rumors abound, everyone is getting caught up in the fact that Google may be entering the gadget business. And while it must happen eventually, a cell phone is not the place to start. 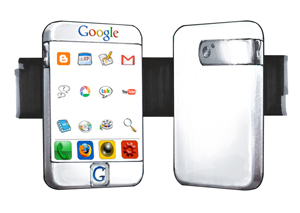 Like every other cell phone, the GPhone will be derivative, yet useful to many people. But unlike the online business, Google will be met with a significant amount of competition that it wields no advantage over. Cell phones are a different ballgame and if you ask me, Google is ill-equipped to play this game. Gphone concept sketch by Lorin Wood. I think the gPhone won't compete with the iPhone. I'm sure it will be cool, but I have the feeling Google is thinking about giving them out for free to satisfy it's advertising market.